We ask them to face danger on a daily basis, but the biggest killer of America's firefighters is not fire itself, and often takes it's toll after they've served years--even decades on the job. Phil Rogers reports. Growing up in the San Francisco Bay Area, Matt Montague knew that what his dad did for a living was dangerous. After all, his father was a San Francisco firefighter. Montague’s father developed cancer shortly after his retirement. Proudly following in his dad’s footsteps, Montague also became a firefighter, now serving in suburban Naperville. And like his dad, Matt got cancer too. Montague is firmly convinced that his family’s chosen profession led to both cancers. And the evidence is overwhelming that he’s right. Dina, the Illinois representative of the Firefighter Cancer Support Network, speaks from personal knowledge. He got cancer too, when he was just 46 years old. The studies are overwhelming. Alarming rates for a variety of cancers, from brain and bladder cancer, to testicular and thyroid cancer, non-Hodgkins lymphoma, multiple myeloma, and breast cancer. The International Association of Firefighters says that a shocking 60% of members memorialized on its fallen firefighters memorial wall, died of cancer. That “toxic soup” in which firefighters do their work, has become the centerpiece of intensive research. 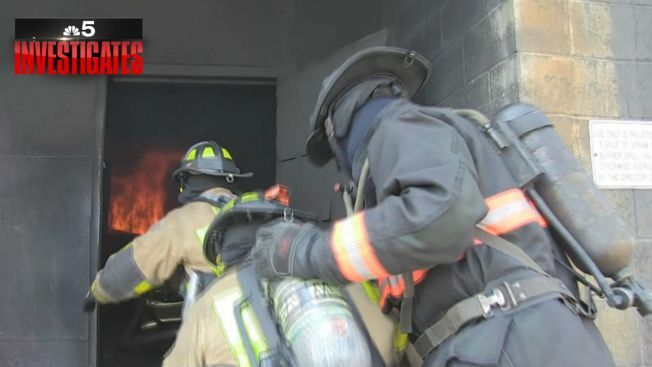 Multiple studies by Underwriters Laboratories and the National Institute of Occupational Safety and Health have focused on what’s in the smoke from burning building materials, and the soot which firefighters often wear back to the firehouse on their skin and clothing. Go back 100 years, and far too many firefighters were killed by fire or building collapse. But back then, the smoke mostly consisted of burning wood, or cotton and wool fabrics from upholstery. Today, firefighters have better safety equipment and better training to hopefully avoid the greatest dangers of the fire itself. But what’s burning in the buildings is heavily made up of plastics and petroleum based products which often give off extremely toxic byproducts. And it isn’t just buildings. Flame retardants for upholstery and carpeting have long been an area of concern---and ironic concern at that. Designed to make fabrics more fire-resistant, researchers have learned some of those chemicals give off extremely toxic gases when burned. And all of that can end up in the soot which covers firefighters when they leave a burning building. That leads to two of the biggest concerns: breathing toxic smoke, and soot which can be absorbed through the skin. And that means not only new practices, but a new culture in firefighting. After all, that soot has traditionally been proof that a firefighter did his job. Hroma says the fire community has an eye to manufacturers of their personal protective equipment, or PPE’s. They are aware, he says, of the increased focus. Now, the two biggest changes are for firefighters to keep their air masks on well thru teardown at the fire scene, and to wipe soot off their hands, faces, and necks, as soon as possible. Naperville is among area departments that have taken major precautions. Every firefighter at the community’s ten firehouses is now given two sets of gear---so that one can be washed if they catch a fire early in their shift. Gear washers are now at every firehouse, and signs are posted cautioning firefighters about areas where soiled fireclothes are not permitted. While the cultural change is significant, experts say the evidence of cancer danger in the fire ranks is so overwhelming, that precautions have not been a difficult sell.